Lower Blood Pressure Naturally, Break up with Salt! 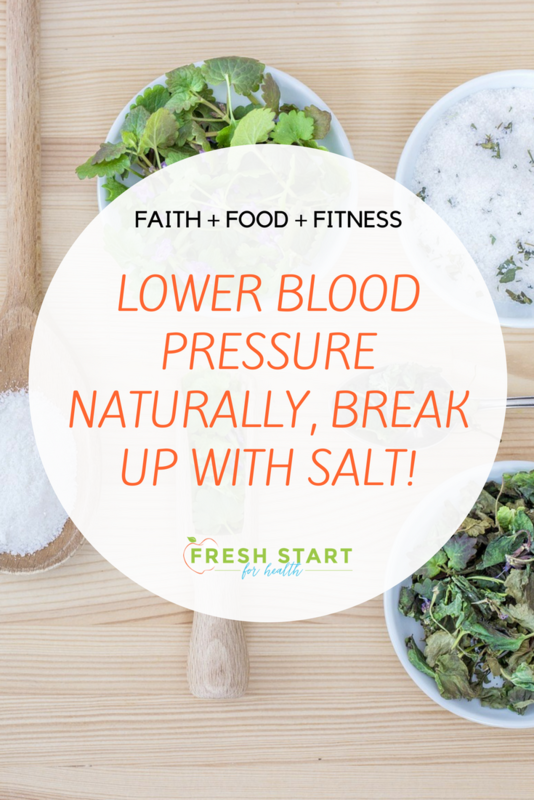 It's time to Lower Blood Pressure Naturally, and Break up with Salt! In my years as a health coach, I've heard from many clients about the battle to reduce their salt intake. Many times, they realize they have to do something about their sodium levels after the doctor has told them their blood pressure is beginning to reach the danger zone. If YOU struggle with high sodium or high blood pressure, be encouraged, it's surprisingly simple to lower your blood pressure naturally if you follow some simple guidelines. "Can't we just get rid of salt altogether?" Many of my health coaching clients have asked me this. Seems like we could just get rid of salt, right? Since too much of it causes high blood pressure, then why not? Believe it or not, our bodies actually NEED a daily amount of sodium to be healthy! However, 2300 milligrams of sodium daily is ALL our bodies need to function healthily. And remember, this is just 1 TEASPOON, so it adds up QUICK through our foods and drinks! Watch my quick video below for some easy guidelines breaking up with the salt in our diets! Learn more about the role sodium plays in creating high blood pressure and exactly where it’s sneaking into our daily food intake! The typical American diet includes upwards of 1 ½ - 2 teaspoons of salt each day which adds up to between 3500-4000 mg each day. This is almost twice as much as our body needs! Normal blood pressure is 120/80 and pre-hypertension 139/89. Stage I High Blood Pressure is 159/99 or above. Anything over 160/100 is dangerous - and considered moderate to severe blood pressure. Though there are of course OTHER LIFESTYLE FACTORS that contribute to the condition of hypertension, like chronic daily stress and smoking, to name just two, we know that too much sodium intake is very closely related to high blood pressure. In fact, it is so closely related that reducing our intake of it can reduce our blood pressure (if it is high) in as quickly as a few days! Good news, right? Here’s a quick self-diagnosis method: if your ankles swell up or you end your day with those indentations showing from your socks and shoes it’s a good bet that you’re battling some water retention as a result of higher-than-needed salt intake in your day! The incredibly good news about all of this is that it isn't too complicated to reduce our salt intake and to support a healthy heart! So where is sodium & salt hiding in our diets? (Spaghetti Sauce RECIPE link HERE!) Click HERE for our easy and delicious homemade spaghetti sauce recipe to use as an alternative to canned, high-in-sodium AND sugar varieties! Most commercially prepared SPICE MIXES include extra salt as well! Watch out for items like Fajita seasoning, Taco seasonings etc. Marinades and salad dressings are often high in sodium. Canned vegetables and canned beans! Steer clear of canned veggies. You can use canned beans in a fresh and healthy eating plan, just look for low sodium varieties and make a practice of RINSING all canned beans!! Bottom line: ANY and ALL pre-made, boxed, canned, and packaged items are usually super high in sodium and contribute to high blood pressure. Fast foods and many restaurant foods are as well. "So, what can we do to reduce our salt intake and lower high blood pressure naturally?" Go back to natural, whole, healthy FRESH foods in the produce isle! Make more of your own dishes, as you can control the amount of additives and salt that you add. Stay away from take-out! If it comes in a drive through it’s super high in preservatives and sodium. Avoid all pre-prepared foods –canned or packaged soups, pre-made entrees (frozen, canned, packaged)…if you’re opening a package, at the very least READ THE LABEL and RINSE! The cure for most of our over-indulgences or unbalanced food intake is truly a return to the “old-school way” - eating whole foods and cook meals at home. Just this one change will make a HUGE difference in your sodium intake! One of the reasons we include an Eat FRESH * Move FRESH * and Think FRESH action steps in our signature FRESH Start Program is because our bodies were designed by our Creator to operate fully and in wholeness if we’re moving, hydrating and purposefully thinking about our lifestyle choices DAILY! Making a habit of balanced exercise every day, hydrating enough with water daily, and eating FRESH choices all contribute to our overall health. This way you are supporting your body’s natural ability to flush through any extra sodium you’re taking in! This also flushes through environmental toxins we’re unaware we are taking into our bodies each day. A personal invitation...Join our FRESH Living movement! The FRESH Living movement that began six years ago is now a vibrant community of beautiful individuals around the world, supporting each other, taking simple action steps and achieving remarkable changes in their lives! Please let me know how we can support your healthy-living journey in any way! We have an interactive community on Facebook where we support and encourage each other daily through challenges, posts and prayers…go here to join our free online community!